It was nice to wake up to a winter like scene this past week. The fresh fallen snow was a delight to see after our typically dreary November days. It was fun to get out and play in the snow, make snowmen and see all of our holiday decorations enhanced by snow. Whenever there is a fresh snowfall I can’t help but think about a recipe that I learned to make when I was about six years old… Snow Cream. As a child, I was amazed how easy and fun it was to make dessert out of snow. I even began to believe that I could end world hunger with all of the snow that fell in my small Ontario home town. I remember vividly as friends of the family came to visit us from Alabama late one fall to visit during hunting season. As luck would have it we had an early snowstorm which dumped several inches of fresh fluffy snow. Seizing the moment; one of our guests ventured outside with some bowls and collected as much snow as possible and quickly went to work stirring together some milk, sugar and vanilla. Then handful after handful I gradually added the snow while we took turns stirring the mixture. With short work we had created a couple of litres of Snow Cream that we drizzled with maple syrup. Most people who have regular snowfalls and accumulations are the ones who have never heard of snow cream. This simple dessert seems to be more widely celebrated in the deep south of the United States a place not known for snow. It was not long ago that electricity was not a household item, making chest freezers rarer than the snow needed to make this recipe. So when it did snow in the south, this was an easy way to celebrate in Southern fashion by making do with what you have on hand. The great thing about making snow cream is that it doesn’t require too many ingredients and those that it does can be found here locally. Naturally my milk and cream came from The Kawartha Dairy Company and my maple syrup came from my own trees leftover from early spring. Alternately one could use crushed up candy canes instead of maple syrup to make a Christmas style snow cream. The only advice that I give for the following recipe is to make sure the snow is clean. This goes beyond all the yellow snow jokes as you should only use fresh fallen snow, and be aware that it takes at least one to two hours for a fresh snowfall to clean the pollutants from the air, so use only snow that has fallen after that first cleansing snow. How to go from Snow Storm to Snow Cream! 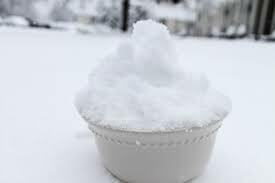 Prepare an ice bath by filling an extra large mixing bowl with ice or snow half way. Set a slightly smaller bowl into the ice bath. Better yet, take your mixing bowl outside and set it in the snow. Combine the cream, milk, sugar, and in bowl and whisk together. Continue stirring while adding snow to the cream based mixture 1-2 cups at a time. 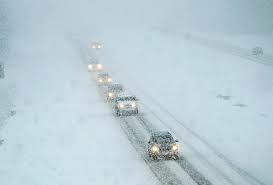 The amount of snow needed will vary depending on the size of the snow crystals and the temperature of the snow. Stir in enough snow to make the cream mixture start to resemble ice cream in consistency. Garnish with crushed candy canes. 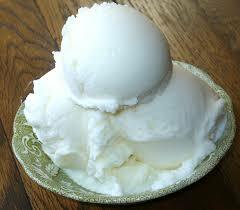 Serve and eat immediately as Snow Cream is not to be stored for any period of time. Posted on Thursday, November 24th, 2016 at 9:23 pm	and is filed under Recipes.